The Yak-17 is a rank V Russian jet fighter with a battle rating of 6.3 (AB), 6.7 (RB), and 7.0 (SB). It was introduced in Update 1.33. Similar to its hybrid predecessors, The Yak-17 is arguably one of the most underestimated planes in the game. 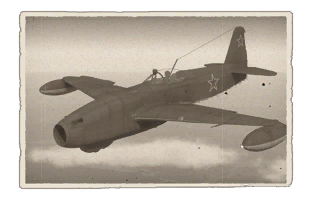 Although its stat card reveals what would be considered "sub-par" performance and armament, the Yak-17 is both a unique and deadly fighter. Unlike its propeller-driven counterparts, this first generation jet aircraft wields the ability to hold on to energy in a straight line, whereas prop aircraft will slowly lose speed. This coupled with its good rate of turn allows the Yak-17 to defend itself against both propeller and jet-powered aircraft, which is what it will normally face in all game modes. The Yak-17's major faults include a low top speed, poor acceleration, little armor protection, and small ammunition pool which collectively make this aircraft harder to use than even other first-generation jet aircraft such as the He 162 A-2, the Meteor F. Mk.3, and the F-80A-5. Although it is driven by a jet engine, it is important to recognize the faults and oddities within this aircraft series as they are not representative of the traditional "jet fighter" at all. The Yak-17 is most easily viewed as a late-war Yak-3 powered by a jet engine and with different armament. 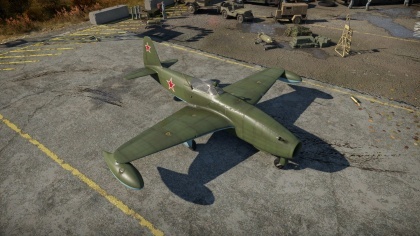 The Yak-17 differs from the previous Yak-15 and Yak-15P in that it has a different cockpit layout, a different gun sight, and tricycle landing gear. The Yak-17 also carries two fuel pods on the end of each wing, similar to the MiG-9/Late. Having a tricycle landing gear set instead of the previous two-wheeled design allows the Yak-17 to both slow down easily when landing due to the drag of the extra wheel and land easier as there is no chance of the aircraft flipping from excessive braking. Thus, the Yak-17 performs almost identically to the Yak-15 and Yak-15P as its "stat card" shows. ? ? 13 250 ??.? ??.? ??.? ??.? ??? 8.5 mm Steel plate in pilot's seat. In realistic battles, climbing with this aircraft at the start of a match is not always the best course of action, considering how poor the Yak-17's rate of climb is. Instead of the traditional, slow angled climb the Yak-17 is best used in a "zoom climb" where once enough energy has been built up at a low altitude the Yak-17 pilot will pitch up, thus gaining a lot of altitude quickly. This way, if attacked during the first few minutes of the match, the Yak-17 still wields some energy whereas had the Yak-17 been slowly climbing, it would have had to face another aircraft's guns. In order to shake an enemy, especially a prop driven enemy, dive low to the ground to ensure your assailant's speed only decreases. This is called a "speed trap" and can either be followed by a "hammerhead" attack or a continuation of the escape. This tactic of utilizing the Yak-17's ability to hold on to energy in a straight line is negated when facing other jet aircraft who wield the same ability. This is where the Yak-17's dog fighting abilities come into play. Because it is so similar to the Yak-3 and the previous Yakovlev jets, the Yak-17 retains some of their maneuverability characteristics, namely their turn times. This facet often proves an indispensable one as other first generation jets will not be able to maintain a tight enough turn circle. However, like its predecessors the Yak-17 is severely hampered in its damage output due to its reliance on a single set of 23 mm NS-23 cannons, with 120 shells total. It is possible to expend this pool in seconds. The Yak-17 shares this downfall with aircraft like the Ki-200, and the Me-163. Firing in small, accurate bursts negates this and is the most efficient way of destroying enemies. The 23 mm shells these cannons fire are extremely deadly when they hit and often rip enemies apart. To use the guns most effectively, be close to your target. The reason for this is twofold: First, the limited ammo means you want your shots to count. Being close to your target will give your cannons the highest chance of hitting. The second reason is because of the ballistics of the 23 mm shells - their muzzle velocity is not very high, meaning you have to lead your targets by quite a bit. If you are closer to your target, you won't have to lead them by quite as much, although still more than most other cannons. With some practice, it is possible to consistently get about 3 fighter kills with one load of ammunition in realistic battles. Using the Air Targets belt is the most effective. However, attacking bombers is best left to other planes with more firepower, since the Yak-17 does not have the firepower or ammunition to reliably kill heavy bombers without sustaining heavy damage. Heavy fighters such as the F7F-1 may also take longer to destroy than other fighters. In arcade battles, the Yak-17 is capable of breaking up a "furball" due to its impressive turn time. This coupled with its hard-hitting cannons makes any Yak-17 pilot an indispensable asset to any arcade team.